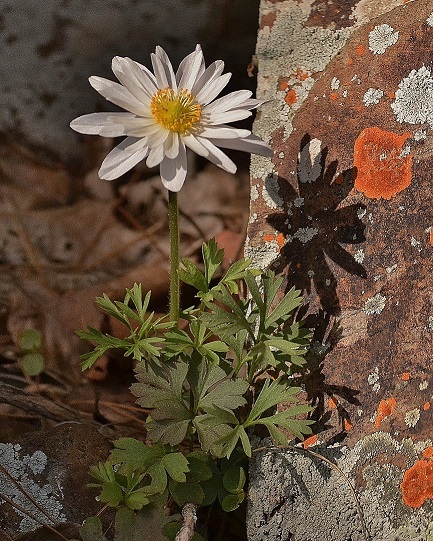 A recent post on Anemone species by the Arkansas Native Plant Society (ANPS) contained an unfortunate error. ANPS apologizes for any confusion that may have been caused and offers the current post as a correction. From Texas to Kansas and eastward to the Atlantic. In Arkansas, found in the Coastal Plain in the southern part of the state and in the mountains of northern and western parts of the state. 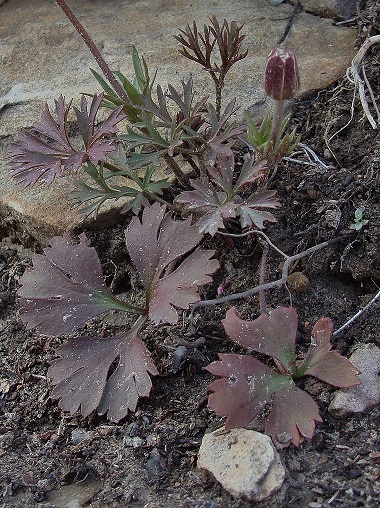 Leaf growth occurs in winter with flowers appearing in March-April but typically blooming later than Carolina anemone. 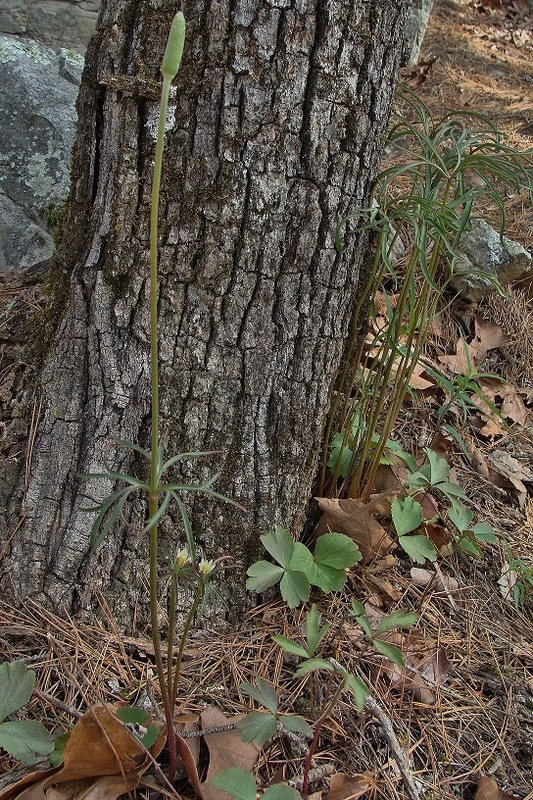 Found in open dry woods and prairies and on rock outcrops. Basal leaves are finely hairy, fleshy and silky, being slightly dissected with irregular margins. 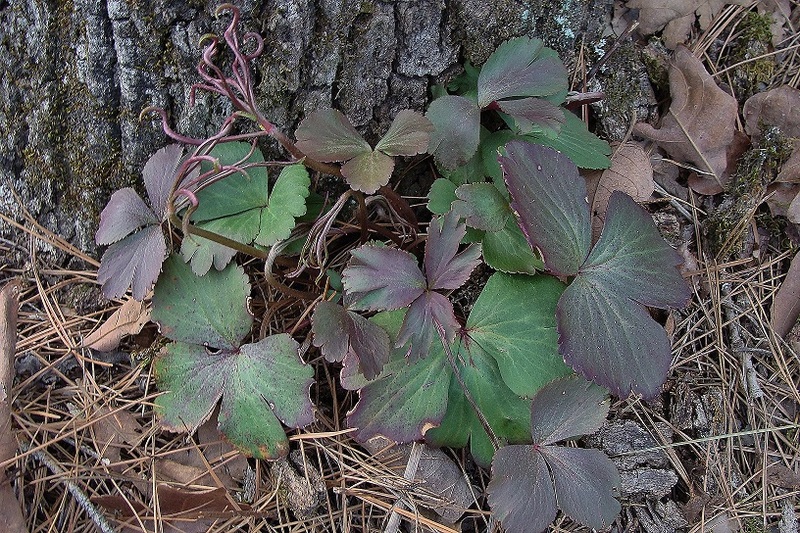 Leaves and stems are reddish in cool weather, becoming greener later in the season. White to greenish flowers grow from a whorl of twisted, finely divided leaves. Flowers are up to 2 inches wide with typically around 10 sepals on a stem up to 2 feet tall. Sepals slightly lavender on outside. Slim cylindrical seed heads are about three times as long as wide. Seeds tend to stay on the stem for several months. Same flowers of ten-petal anemone as in previous photo with nearby immature seed head. Found from South Dakota and Texas, eastward to Wisconsin, Indiana, and the Carolinas. 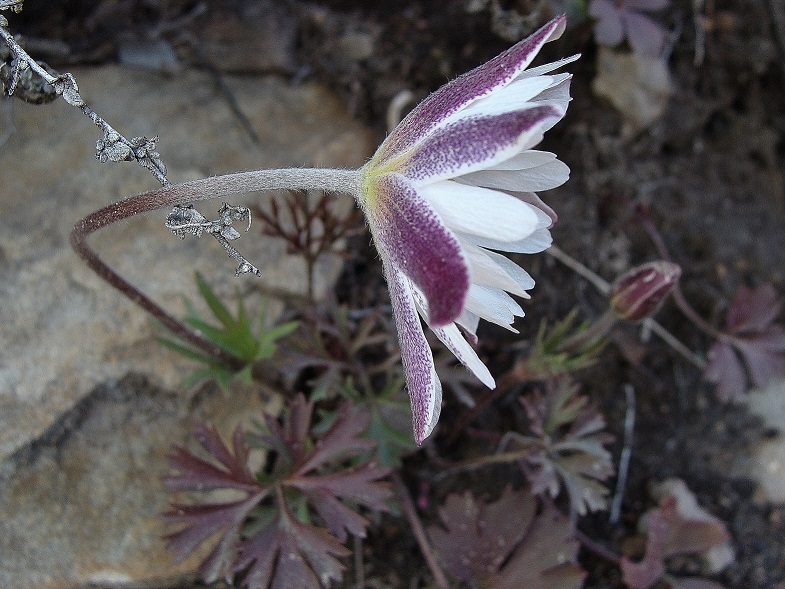 In Arkansas, like ten-petal anemone, found in the Coastal Plain in the southern part of the state and in the mountains of northern, central, and western parts of the state. Leaf growth and flowering occurs in March-April. 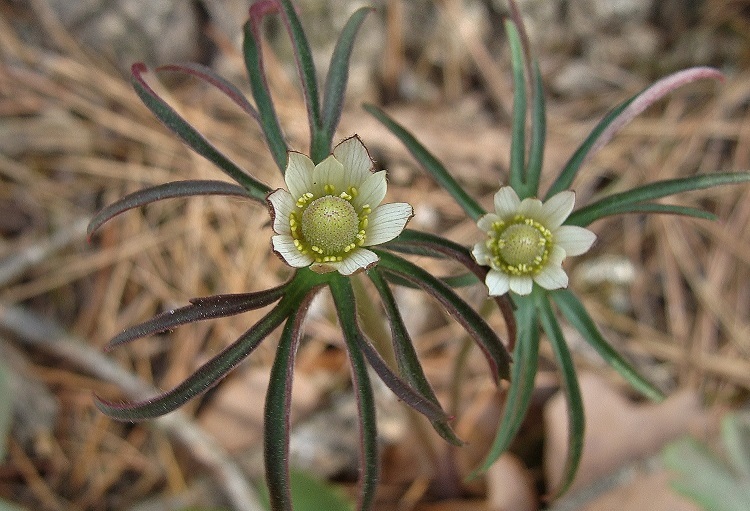 Found in dry soil in rocky open woods, prairies, and barrens. Basal leaves are deeply divided with toothed margins. Leaves are finely hairy, fleshy and silky in appearance. Leaves are reddish in cool weather, becoming greener later in the season. Large flower buds are purplish and initially nodding but face the sun when in bloom. Stems grow to 12 inches tall. Showy white flowers, up to 2 inches wide, have many narrow overlapping petal-like sepals of various sizes. Undersides of sepals retain a purplish color at bloom. Seed heads are rounded to somewhat cylindrical, ½ to ¾ inch long. Seeds tend to disperse soon after drying. Found throughout eastern North America, but generally absent from the Gulf and southern Atlantic Coastal Plains. In Arkansas, occurs primarily in the Interior Highland counties of the Ozark Mountains, Arkansas Valley, and Ouachita Mountains. Found in moist to somewhat dry soils in woodlands and forests often on stream terraces or north-facing slopes. Leaf growth occurs in spring with flowers in May-July. The leaves, on long petioles, are noticeably veined, large and hairy, with coarse teeth so that the plant has an open somewhat scraggly appearance. Up to 3 feet tall. Flowers, with five greenish to white sepals, are about 1 inch across. Seed heads are short-cylindrical, not more than twice as long as wide. Seeds tend to stay on the stem for months. 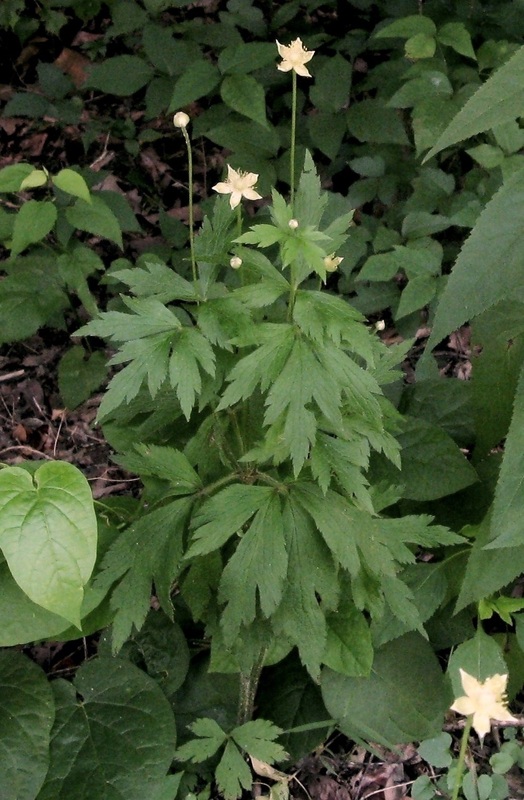 Tall thimbleweed in bloom, showing large, coarse leaves. 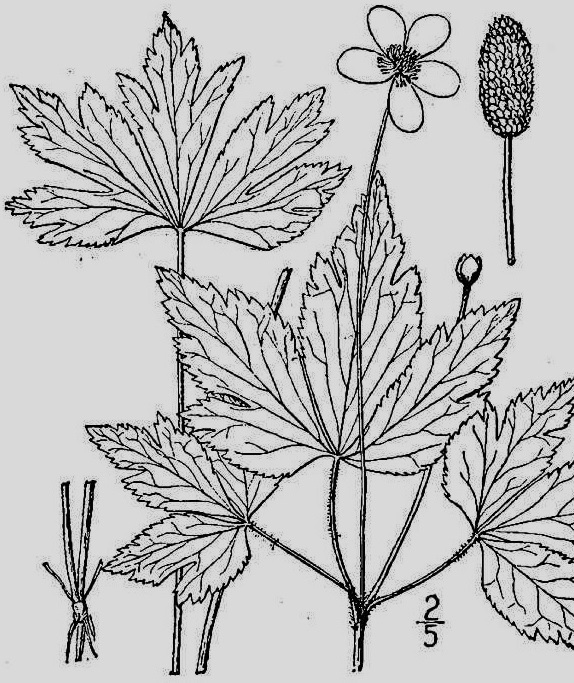 Tall thimbleweed illustration, showing the 5-sepaled flower and the thimble-like fruiting head. Photo from USDA-NRCS PLANTS Database / Britton, N.L. and A. Brown. 1913. An Illustrated Flora of the Northern United States, Canada and the British Possessions. 3 vols. Charles Scribner’s Sons, New York. Vol. 2:99. Tall thimbleweed flower: the central head of pistils is surrounded by numerous stamens. Written by Sid Vogelpohl with edits by ANPS. 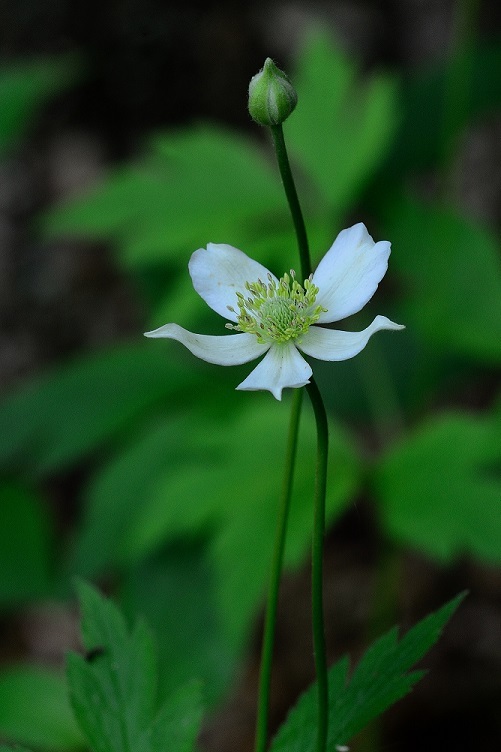 This entry was posted in Know Your Natives, Native Plants, Wildflowers and tagged Anemone, Anemone berlandieri, Anemone caroliniana, Anemone virginiana, Carolina anemone, Ranunculaceae, Tall Thimbleweed, Tenpetal Thimbleweed. Bookmark the permalink.